For our challenge this week Maryann has asked us to create a card using the Set Back Stamping Technique as shown a couple of months ago by Jennifer McGuire in a video here. When I first read Maryann's challenge I thought ... great! I had just watched this on Jennifer McGuire's blog, but then when I started to think about it I thought yikes .... I seldom buy coordinating dies as I use my Scan N Cut to cut out most of the images I use that need cutting. Fortunately though I had just purchased the coordinating dies to Honey Bee Stamps Shine On Stamp set, as I wanted the dies for the sentiments in the set. I also started looking for a few other dies to coordinating with stamps and found a few sets that went with the flower stamps I was purchasing. So I was all set for plan A, B, C and possibly even D and E if necessary, who knows what you want to use until you actually get down to make the card ... not me anyway!!!!! As you can see, in the end I went with Plan A ... the Honey Bee Stamps Shine On Stamp set with coordinating dies. As I like to create cards that do something rather than just a plan flat card, especially for the challenges I do, I decided to see if I could combine the Set Back Stamping with a Double Slider Surprise Card which is what I have made above. I die cut two additional fronts for the Double Surprise card one from white cardstock and the other from the polka dot patterned paper. I used the nail polish die from the Shine On die set to die cut the shape from the patterned paper/cardstock panel. Using my MISTI I used the patterned paper panel to line up my stamp through the die cut opening and then stamped the nail polish. I also cut a piece of fun foam and die cut the bottle from the centre of it. It is hard to see in the photo, but I added Nuvo Aqua Shimmer to the pink nail polish so that it would sparkle. I added the sentiments to each of the slider panels using the scallop square from Karen Burniston's Upsy Daisy Pop-up die set for the bottom layer. To finish off the front of the card I added some pink transparent crystals from Studio Katia. For the inside of the card, I added a stripe of the diagonal striped patterned paper to the left side of the card. I added a sentiment using Sunny Studio's Sparkle stamp set with coordinating dies. 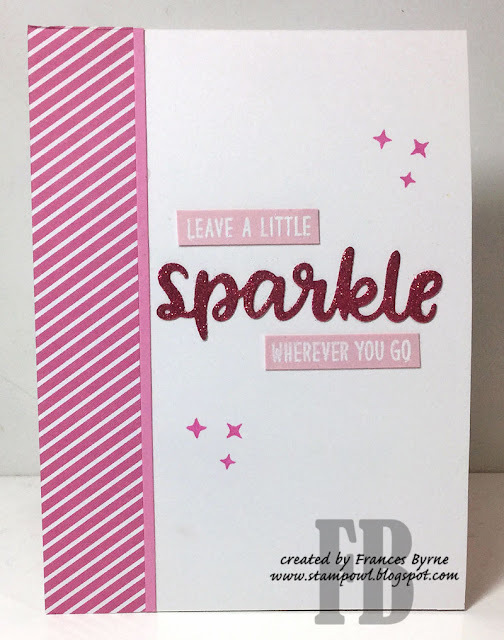 The "Sparkle" sentiment was die cut from white cardstock that had Clear Double Sided Adhesive Tape on the front and then covered with Elizabeth Craft Design's Peony Pink Silk Microfine Glitter. Cool card, Frances....love the design, colors and your set back! Man, oh man, do I love this card!! What a perfect image and die for this fun technique!! All the girly girls in my family would absolutely love this amazing design, France!! 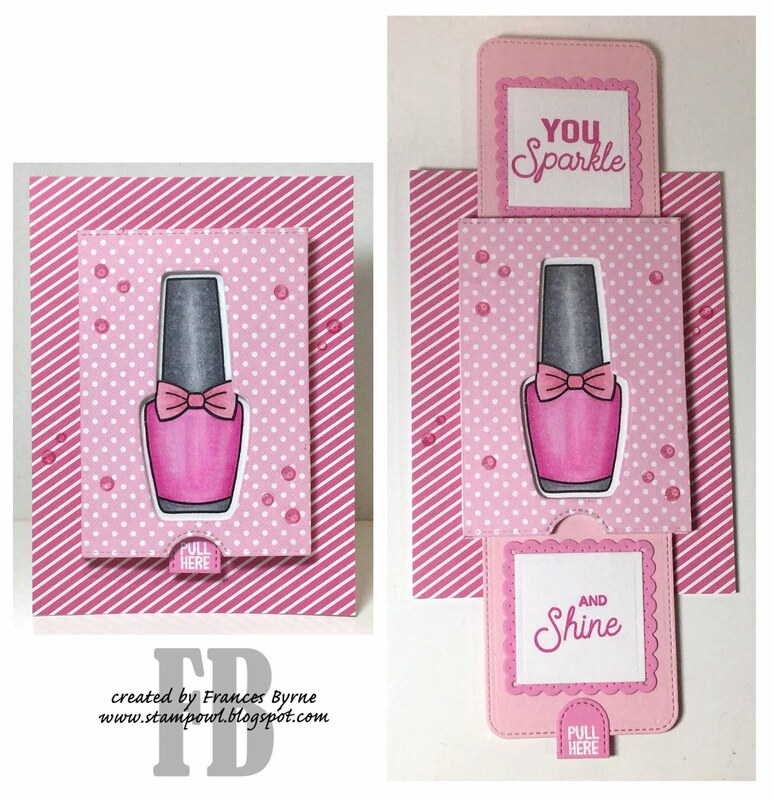 Such a terrific slider card - perfect with the glitz and all the pink! Lovey girly girl card! What a great card, Frances! That double-slider looks really fun! wow. Just wow. My granddaughter's would LOVE this!! I love that you have used this stamp and die set for this technique. It is fabulous and so pretty.